WYSO Public Radio held the first session of its “Community Voices” training project Saturday, January 29 with nine students from Dayton and Yellow Springs. They will spend five months in monthly training seminars learning radio production skills. The nine trainees are Dennie Eagleson, Luke Dennis, Liz Cambron, Sehvilla Mann Brooke Bryan and Nick Long from Yellow Springs, plus Shelly Hulce, Susan Byrnes and Caressa Brown from Dayton. Sarah Buckingham, WYSO Community Voices Coordinator and Neenah Ellis, WYSO General Manager are teaching the course. 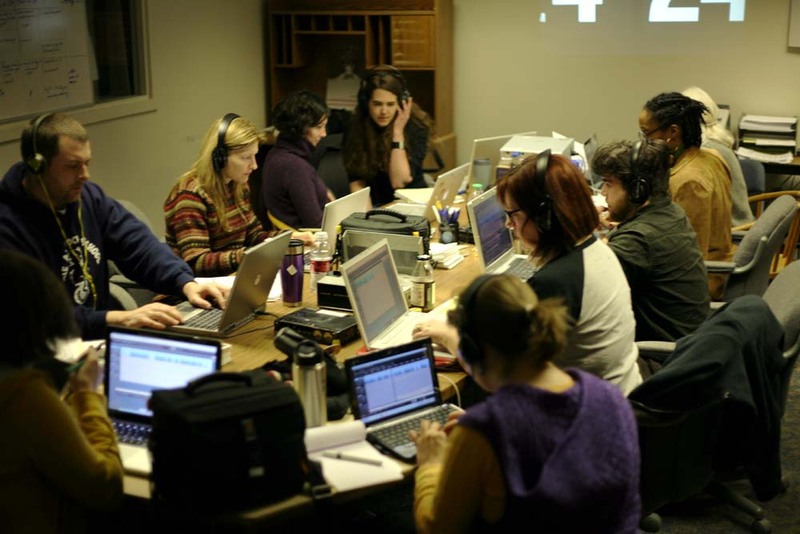 In May, the trainees will become part of a master class with public radio producer Ira Glass, who will be visiting Dayton as part of a WYSO fundraising event. The five month course is comprehensive introduction to radio projection and course topics include audio editing, field recording and microphone technique plus writing for radio, interviewing skills and voice coaching. This first training project is being offered free of charge to participants. Funding to support it came from the Yellow Springs Community Foundation, two Yellow Springs donors and the DP&L Foundation of Dayton. Ellis began her tenure as WYSO General Manager two years ago after forty years of radio experience, much of that time spent as a producer for NPR, but she has been clear that her goal is to focus on local programming in her role at WYSO. Sarah Buckingham, the Community Voices Coordinator, returned to Yellow Springs in 2010 after graduating from Antioch College in 2008. She subsequently studied at the Salt Institute for Documentary Studies in Portland Maine, where she was enrolled in the radio documentary program. In the photo: (clockwise from bottom) Liz Cambron, Luke Dennis, Susan Byrnes, Brooke Bryan, Sarah Buckingham, Dennie Eagleson, Caressa Brown, Nick Long, Shelly Hulce and Sehvilla Mann.